Everybody has heard of Lands End to John O'Groats, abbreviated to LEJOG by long distance walkers and cyclists (or JOGLE if they are heading in the less popular southerly direction). What you might not know is that both Lands End, and John O'Groats, are massive frauds. Lands End, for example, is not the furthest place in Britain from John O'Groats – Gwenapp Head, a few miles south, is surely marginally further. It may be the westernmost point in England, but not mainland Britain: that is Ardnamurchan Point. It is certainly not the southernmost point. And what of John O'Groats? It has even less claim to singularity than Lands End. Duncansby Head, a few miles away, is marginally further from Gwenapp Head, as well as being considerably more scenic than John O'Groats. However it is the largely unknown Dunnet Head that should be best known. This is the northernmost point on the British mainland. It is an imposing headland, a great pile of old red sandstone rearing up between the Pentland Firth and the flat grey farmland of Caithness. Dunnet Head in early summer is home to puffins, and as the lighthouse building has been converted into a music recording studio, the faint sound of drums can occasionally be heard amongst the call of fulmars and wind. A great place to concentrate on your music, miles from the nearest facilities of any kind. You can see the Old Man of Hoy from Dunnet Head and, on a clear evening, get a great view west towards Ben Loyal, Ben Hope, and Foinaven. All without any tourist crowds whatsoever. Dunnet Head. It’s better than John O’Groats. All the four corners of Britain have their own character, and all are worth visiting. Except one. Can you guess which one yet? Ness Point is the easternmost point of the low-lying bulge of East Anglia, but unlike some parts of Norfolk and Suffolk, is not redeemed by a wide beach or charming village, but the down on its luck town of Lowestoft. To reach Ness Point from the station, head past the panhandling junkies outside, past the port and, on the other side of a small industrial estate, you'll find, on a low, windy promenade, the easternmost point of the British mainland. Lowestoft's charm is in its authenticity and it's proper working port. None of your antique dealers and organic deli nonsense here. That man is little to be envied whose patriotism would not gain force upon the plain of Marathon, or whose piety would not grow warmer among the ruins of Iona. 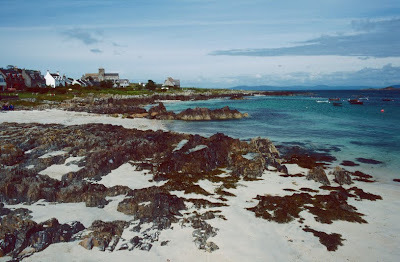 there is more to Iona than the abbey, and this time, I wanted to see something of the rest of the island. First we walked south from the pierhead, towards the southern end of the island. 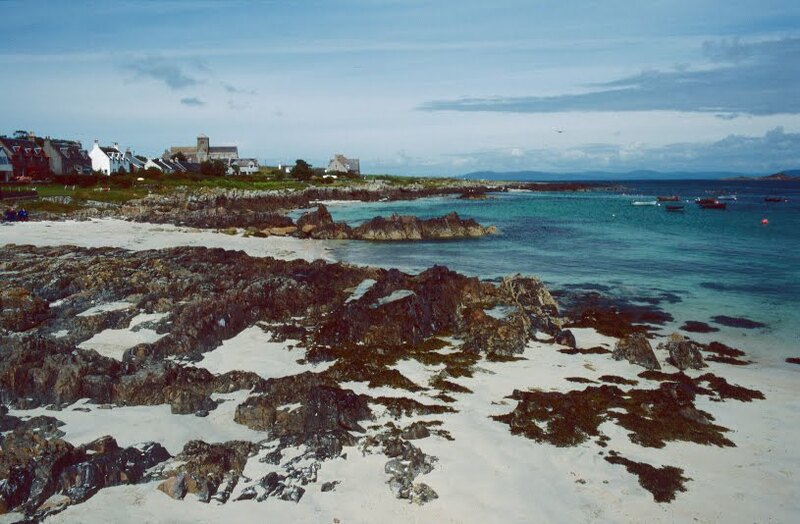 Iona has an unusual luminance even in dull weather, due to its shallow beaches of white sand. Even when the storm clouds gather over the dark volcanic hills of neighbouring Mull, low lying Iona seems bright. No wonder holy people chose this as a site for their contemplations. From the south of the island, we walked across its centre to Camas Cuil an t-Saimh, the Bay at the Back of the Ocean, where somebody had raised a number of artfully placed stones. There are not many houses on the island, and I wondered how many were lived in all year round, and how many were holiday homes, or used by the Iona Community for visitor accomodation. 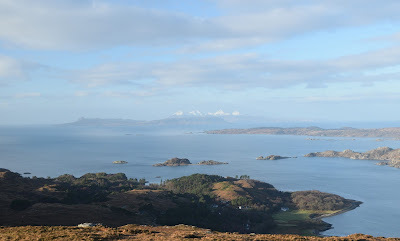 We returned to the east side of the island, and headed up Iona's miniature hill, Dùn Ì, all 100m of it. It commands a wide and windy view of Mull's western seaboard, Staffa, the Treshnish Isles, and nearer to hand Fionnphort, the abbey, and Iona's beaches. Happiness is a sunny lunch in the lee of the wind with a view over Iona. The white beaches to the north of the island called. Even an entire day on Iona was not enough. I would like to return for a couple of days, get a better feeling for the island. Some day. On our return home rain swathed the dark hills of Mull whilst the sun shone brilliantly on our lochshore road. Iona is an island with a long history of holiness. It is known that Crimthann, a Dalriadan prince of the 'Clan' Conaill, left his homeland of Ulster in disgrace after causing a small war over copyright. 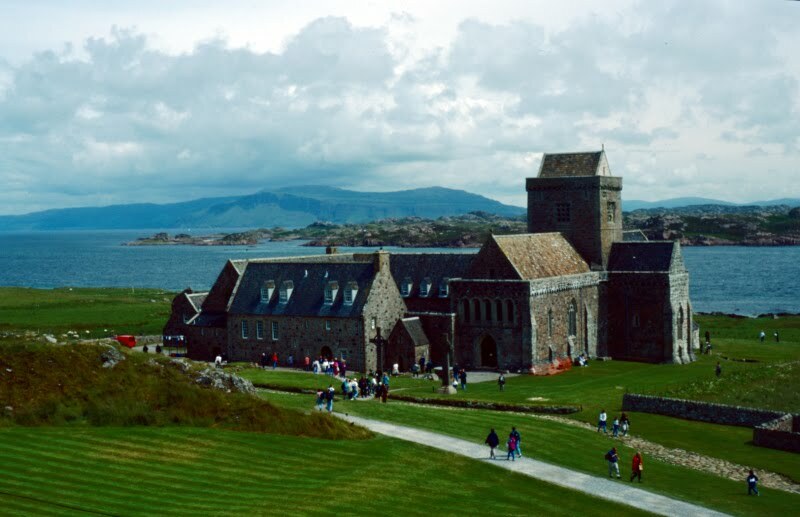 He was permitted to found a monastery on Iona in 563 by Conall mac Comgaill, king of Dalriada. Legend has it Crimthann made other landfalls, in Kintyre for example, but as he could still see Ireland he could not stay. By the time he had sailed as far north as Iona, Ireland was no longer visible on the distant horizon. To commemorate this a cairn, Carn Cul na Eireann, Cairn with the Back to Ireland, was constructed on a height above Iona's southern shores. Crimthann went on to achieve many stirring (and many mythical) deeds, being known in Gaelic as Colm Cille, Dove of the Church. In English we call him St Columba. Columba and his sucessors brought fame to the island, which became the epicentre of what is now (but wasn't then) identified as 'Celtic' Christianity - a strain of worship that favoured remoteness and asceticism in the style of the desert fathers, as opposed to the more worldly 'Roman' style of bishops based in cities. Iona was no backwater however. Pictland and Northumbria were evangelised from Iona, and from Iona's scriptorium came arguably the supreme example of Dark Ages art, the Book of Kells. This was removed from Iona to Ireland during Viking attacks and can be seen today in Dublin. Other treasures can still be seen at the abbey. The distinctive crosses of St Martin and St John are in a style unique to this part of the world. Also of interest is Iona's old graveyard, Reilig Òdhrain. 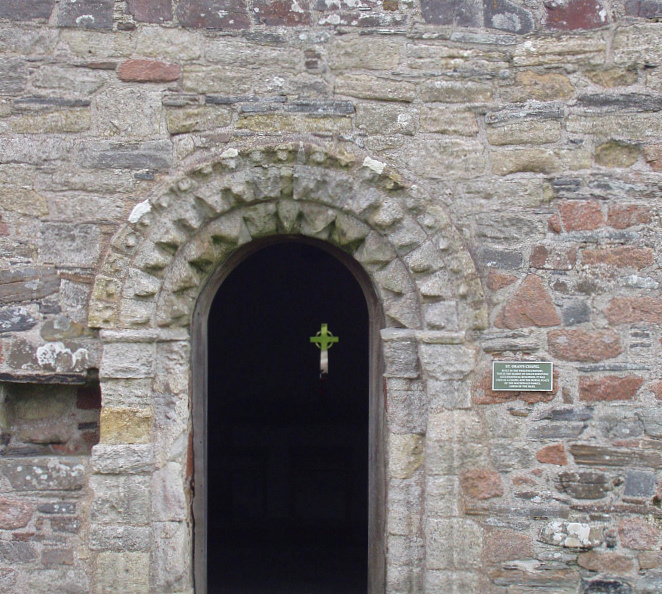 It has been in use since at least the 8th century, and its small chapel of St Oran is the oldest building still standing on Iona. Eight kings of Scotland (including both Duncan and Macbeth), dozens of Dalriada, four of Ireland, eight of Man and Norway, and numerous clan chiefs are buried here. In later times a legend grew up that the apocalypse would be heralded by a great flood - but that Iona, alone, would be spared. Perhaps this contributed towards its attractiveness as a royal graveyard? The latest chief to be interned here is John Smith, an Argyll native widely respected across Scotland (he was the Labour party's last left-wing leader). He was generally acknowledged as Prime Minister in waiting when he died of a heart attack in 1994. His replacement was Tony Blair. The age of saints made Iona famous, the most holy site in Scotland, Gaeldom's Mecca, but in 795 it was attacked by Vikings. The Book of Kells was taken in the 9th century to Ireland and the remains of St Columba moved to Dunkeld. The new kingdom of Scots would be based on the east coast, and Iona and its Abbey fell into general obscurity until 1938. This was the date the modern day saint George MacLeod founded the Iona Community, an ecumenical community dedicated to peace. The community rebuilt the ruined abbey and it now houses many visitors attracted to the peace and spirituality of the place. For the early saints certainly had an eye for a naturally beautiful location. Or did they? For it may well be that Columba was far from the first holy man on Iona. The island name was first written down in Latin around AD700 as Ioua, meaning 'yew-place'. The yew was the sacred tree of the druids, and a theory has been put forward that Iona was a centre of druidism. Although there is no archaeological proof, and only tantalising glimpses of documentary evidence of druids on Iona, many early Christian sites were built on top of pagan ones. It would not be at all surprising to discover that the same was true of Iona Abbey. If evidence of druidism is ever confirmed, it might give a tiny piece of support to the little known legend, similar to the better known Glastonbury Legend, of the presence of Mary Magdelene and Jesus on Iona. The life plain of my journey. I trek to sure horizon. The plain whose only end is death. Summer came at last this year, barley waving in the sun. The green land became blowsy, untidy, browning in the heat. Sunset is coming perceptibly earlier on balmy, fly-filled evenings. Time for a coastal walk, short, but full of interest all the same. Eyemouth to Burnmouth. A tourist at the harbour threw food to an inquisitive seal as we set off. Eyemouth is moated to the south by a golf course, rocky views out to the North Sea. The famous painter of industrial scenes, LS Lowry, spent his dotage in Berwick, painting melancholy seascapes. The scene hasn't changed since. To the south, the coastline rears up into a great cliff and the path follows the edge, a crab fishing boat close in far below. Eventually we approached Burnmouth, a picturesque harbour in a break in the cliffs. Burnmouth is a secret gem, somewhere you only ever come across by accident, a delight to find on a coastal walk or boat trip. We had had a good walk, and returned to Eyemouth refreshed in spirit.